BHSU takes on Chadron State Friday night in Chadron. CHADRON, NEB. – The Black Hills State University volleyball team fell, 3-0, to Chadron State College on Friday evening. The Eagles won by scores of 25-17, 25-21, and 25-17.
" It was a disappointing game, Chadron just out-played us," said head coach Kristin Carmichael. "When we would make adjustments to one aspect of the game, we would struggle with another one." Chadron State attacked early going on a 5-1 run to lead the Yellow Jackets, 12-5, in the first set. Kills from seniors Sierra Stugelmeyer and Carisa Becerra cut the Eagles lead, 20-13. Attack errors by Chadron State assisted the Green and Gold, but the Eagles eventually took the initial set, 25-17. In the second set, Chadron State took advantage of another early 5-1 lead. With the help of a kill from Makayla Bell, the Yellow Jackets bridged the gap with a score of 10-8 in favor of the Eagles. Another kill by Becerra brought Chadron's lead within three points. However, the Eagles went on the win the set, 25-21, leading the match, 2-0. The Eagles jumped out in the third set, going on an 8-1 run to lead the Yellow Jackets, 10-3. Back-to-back kills from Stugelmeyer brought the score to 16-11 in favor of Chadron State. The Eagles used a 6-4 run to take the set, and the match. Freshman Jadie DeLange led the Green and Gold with 11 kills. Beside DeLange, Laurel Lech had 27 assists, while Valerie Blake had 21 digs. The South Dakota School of Mines women's volleyball team was tripped up by the MSU Denver Roadrunners, 3-0, Friday night in Denver, Colo., during a Rocky Mountain Athletic Conference matchup. MSU Denver defeated the Lady Hardrockers, 25-11, 22-25, 25-10, 25-17. SD Mines ended the match with 33 kills on 144 attacks, notched 28 assists, 53 digs and five total blocks. The Roadrunners ended with 62 kills on 144 attacks, had 60 assists, 54 digs and 10 total blocks. 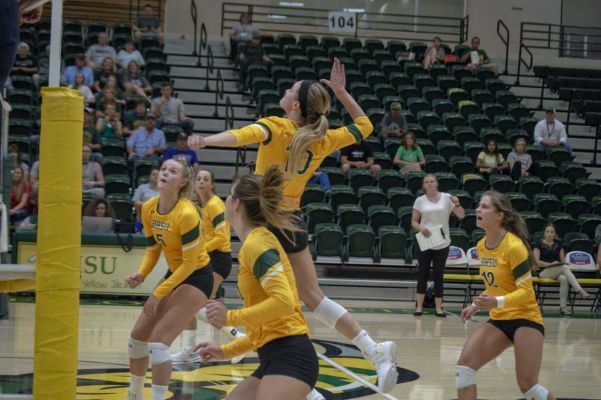 The 'Rockers were paced by freshman Dana Thomson with nine kills on 42 attacks, while junior Hannah Stevenson, junior Caryn Hazard, sophomore Rayleigh Peterson and freshman Shyann Bastian all posted five kills each. Bastian also led the 'Rockers with 20 assists while junior Makinze Maiden came up with 14 digs and sophomore Tana Dahlberg tacked on 11.